About two years ago our beautiful daughter Kim, who is our songbird, almost lost her life when she attempted suicide. Miraculously, she survived. Once she got her strength back she started the process of finding a healthier mental health balance. Of course there are a multitude of ways in which a person can cope with the challenges of a mental illness, but I want to share with you one of Kim’s methods of coping. I actually like to think of it as an extension of her desire to sing. By the time she was 19 years old mental illness had made its grand entrance into her life as well as ours in the form of bipolar disorder. Then on May 21st, 2010 at 7:20 am our songbird temporarily ceased to sing after a second suicide attempt. And with a humble and graciously thankful heart I share with you that she is once again singing. This time she sings not only with her voice but through her creativity as well. And she desires to now use her voice to help erase the stigma of mental illness. According to the National Alliance on Mental Illness (NAMI) “Coping Strategies for Bipolar Disorder” brochure, “Leading a balanced lifestyle can help make living with bipolar disorder more manageable” (14). Furthermore, NAMI suggests that one way a person can lead a healthy lifestyle is to get involved in something like a hobby (15). That is just what Kim has done. 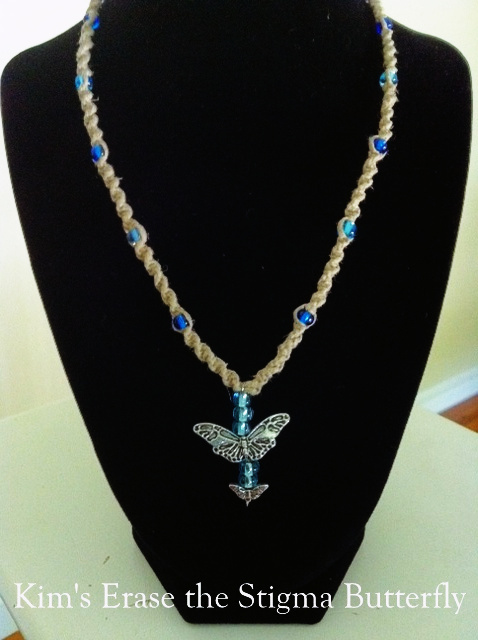 She has found that creating jewelry is a great way for her to cope! Of course there are other ways that she copes, but making jewelry is now one of her favorite hobbies and methods of coping with the challenges of living with bipolar disorder. it’s the one that I’ve tried to write over and over again…I’m awake in the infinite cold…but you sing to me over and over and over again…so I lay my head back down…and I lift my hands…and pray to be only yours…I pray to be only yours…I know now you’re my only hope…” I soon realized it was Kim! I sat in my office and soaked up her voice – relishing in the fact that she is singing again! How blessed and thankful we are that our songbird once again sings. Months before she couldn’t put pen to paper because her thoughts came so fast. Now, she is singing and writing again. And she is creating beautiful jewelry.